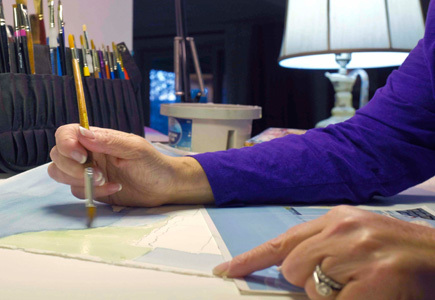 Jane Kielt, an artist from Mount Laurel, New Jersey, doesn’t let her multiple myeloma stop her from pursuing her passion. Jane specializes in watercolors and enjoys including many details in her paintings. 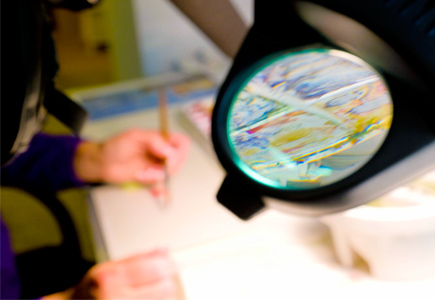 To include details in her paintings, Jane often looks through a magnifying glass while working. 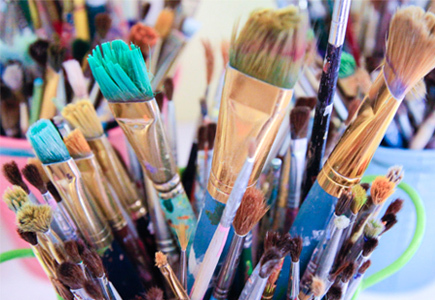 Jane uses a variety of paintbrushes to paint different scenes and landscapes. After formally retiring from teaching art after 26 years, Jane continues to teach painting at a local ceramics shop. With a dab of watercolor paint on the tip of her brush, often working over a large magnifying glass, Jane Kielt likes to get lost in her paintings. Getting lost in herself and the details of her brushstrokes helps Jane change her focus. The “hard time” Jane speaks about is the particularly difficult day or week that often occurs when living with cancer. Jane was diagnosed with multiple myeloma in 2010, just a few years after her father, noted graphic artist Roy Horton, passed away from the same disease. It was from her father that Jane developed her love of art. While at college, she met her future husband, Larry. They were married in 1977. After Larry joined the United States Air Force, they moved around quite a bit before settling in the quiet suburban community of Mount Laurel, New Jersey, with their daughter, Cecelia, and son, Andrew. Through all the moves, and starting a family of her own, Jane continued to teach; 26 years in all. 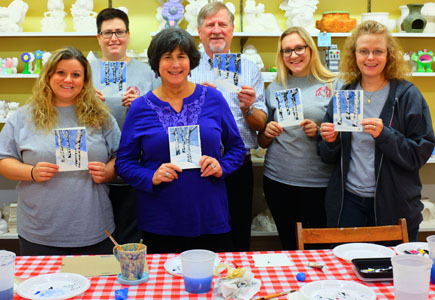 Jane formally retired from teaching in 2008, but she continues to teach painting to adults at a local ceramics shop not far from her home. It was in 2010, when she woke up with a seemingly benign backache, that her life changed. 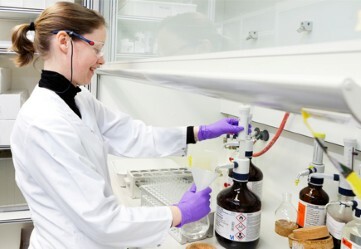 After a battery of tests, she was diagnosed with multiple myeloma. The Kielt family ties are very strong but Jane’s diagnosis, so soon after losing her father, jarred them. Since her initial diagnosis, Jane has gone through many treatments, some of which helped, and others that didn’t. She’s also had surgeries to repair vertebrae as well as two tandem autologous stem cell transplants. She relapsed in 2012 and continues chemotherapy treatment. 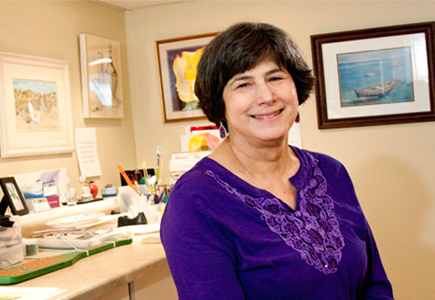 Jane discovered the Multiple Myeloma Research Foundation (MMRF) and has been active in that community. She’s been an ardent supporter of the MMRF 5K Walk/Run in Philadelphia, Pennsylvania, with her team, “Jane’s Village,” growing in numbers and contributions every year. In 2015, Jane’s Village had 105 supporters participate in the walk, and they raised more than $12,000. She was honored to receive the MMRF Spirit of Hope Award, given at every MMRF 5K Walk/Run event to a person who inspires hope and shows extraordinary commitment to the MMRF. Despite her diagnosis and intense treatment regimen, Jane continues to stay as active as possible — riding her bike, swimming, walking in the park, cooking, teaching, traveling, painting commissions, exhibiting in galleries, creating. Jane Kielt is unrelenting. To see more of Jane’s work, please visit her website. Watch the video below to learn more about Jane and how her art helps her deal with her multiple myeloma.